I’ve always wanted to be something whimsical, yet creepy. 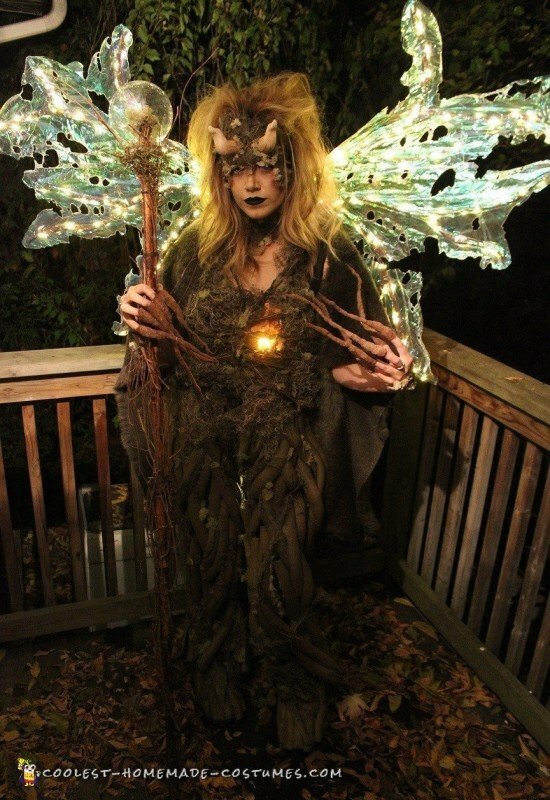 The idea was always there and this Halloween I was able to make my imaginative Keeper of the Forest character come to life! 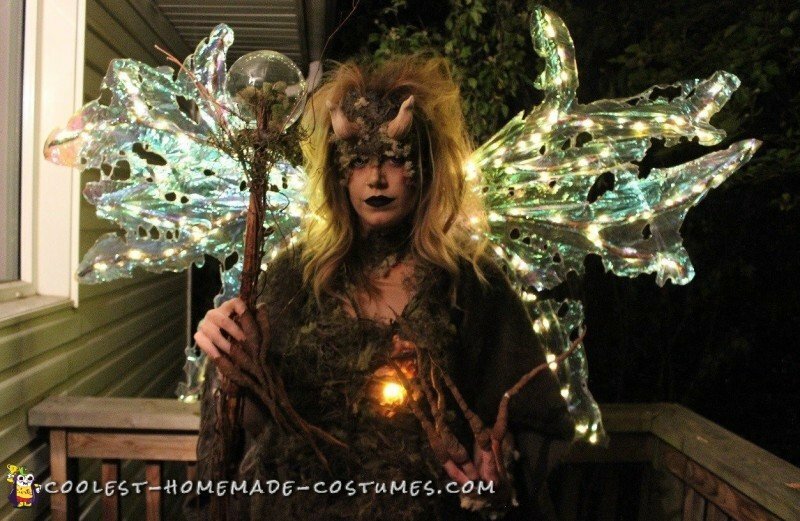 This unique homemade Halloween costume took quite some time to complete (too many hours to count haha). But the end result I was so happy with. I started with the wings. First, I took wire and bent it into the shape I wanted. I then covered all the wire in cotton balls and glue and painted them to look like branches. It was a very long process but only cost a couple of dollars and it looked pretty realistic. I then wrapped them in wire battery powered lights I got off amazon. I took opal cellophane and spray glued two pieces together so the branches would lie in between. Lightly, I ironed over them for maximum security. I cut to shape and using a lighter burned holes to give it a more realistic fairy type look. The legs were made out of foam from the hardware store that is meant for piping. I bent, cut and glued them onto an old pair of long johns. Then, carved and painted them to give a wooded root look. I also covered them in different types of moss from the craft store. I did the same to my shoes which were a chunky heel so I could be taller and it would blend together. My top was very simple I just took a tank top and glued it with different moss. I took a rubber heart from the dollar store, cut it in half and put a headlamp I had behind it so it would glow. Then I made a branch rib cage basically following the same cotton ball and glue technique as the wings to go over top of my shirt. I also used that same technique for my fingers. My staff was made out of a bamboo stick wrapped with twigs around it and on top I made a cute little fake tree and put a plastic DIY Christmas globe from the craft store over top. The staff also lit up when slammed on the ground due to a dollar store find of lights for kids shoe laces. My no sew cape I made out of a meter of material I got at the fabric store. I cut a slit where my wings could attach into a backpack that was underneath to secure my wings. The backpack was made of an old school bag’s straps screwed to a small piece of plexiglass with a piece of pipe strap (sorry, don’t know what the proper name is) the wings slid into. Finally, for my makeup I used liquid latex mixed with coffee beans and twisted little pieces of toilet paper to each piece. I then painted them as well as I could to resemble “bark skin”. My horns were made out of kid’s model magic. I carved and painted them so they were super lightweight and stayed on all night. Even though moving around trying not to knock people out with my wings and trying to deal with fitting into doorways/bathroom stalls haha! 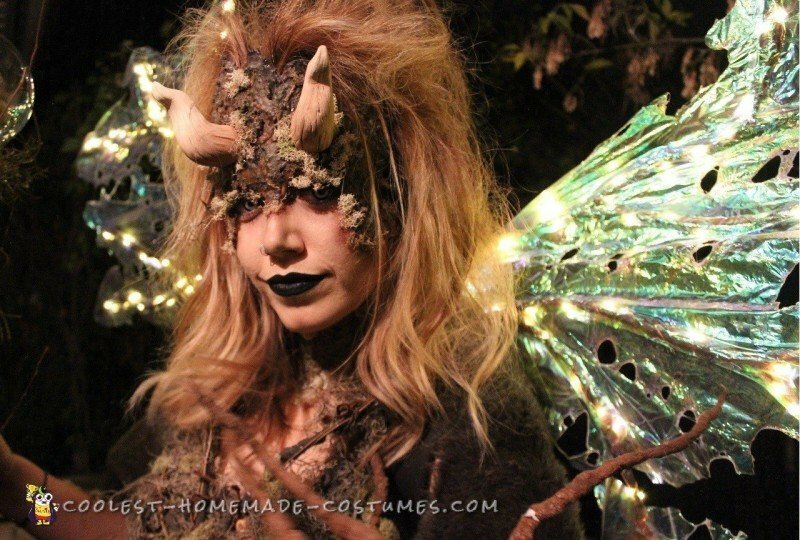 My unique homemade Halloween costume was a complete hit and I had so much fun wearing it! Hope you enjoyed!